I have been on the hunt for a good grilled vegetable salad recipe. With summer vegetables in season, my garden and CSA box are overflowing. And in an effort to be a good steward of my bounty, I try very hard to start with all those items that are perishable. 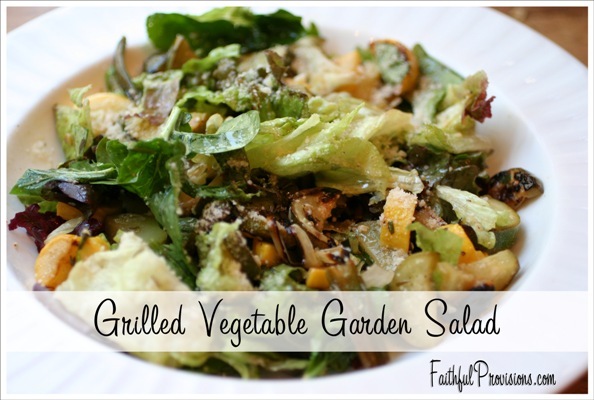 Last week I pulled together this grilled vegetable garden salad to use up some squash and greens before they went bad. I was pretty surprised by the results, so I wanted to share it with you. Honestly, the picture doesn’t do it justice. By layering the flavors using different marinades and dressings, you can really give this salad a power punch of taste. My husband and sister-in-law both ask for this grilled salad! In the recipe below, I’ll share the vegetables I used, but you should substitute in whatever vegetables you have in season or just your favorites. Another twist is to use my favorite Lemon Parmesan Vinaigrette instead of the Greek Vinaigrette. Adds a TON of flavor too! What are your favorite grilled vegetables to put on a salad? Make a double batch of Greek Marinade in a mason jar and set aside. Toss onion and squashes in a large mixing bowl with ⅓ cup of marinade. Season with salt and pepper. While vegetables are hot, toss with 2-3 tablespoons more of marinade and place in freezer for 10 minutes to cool down. Set a timer! While vegetables are cooling, take remaining marinade and add Dijon and ⅓ cup of olive oil, shake well. This is your dressing for the salad. Once vegetables are cooled, toss with salad mix, dressing, and Parmesan cheese. Serve with grilled garlic bread. Enjoy!